The animated Hellboy movies will be summoned to 4K in April. 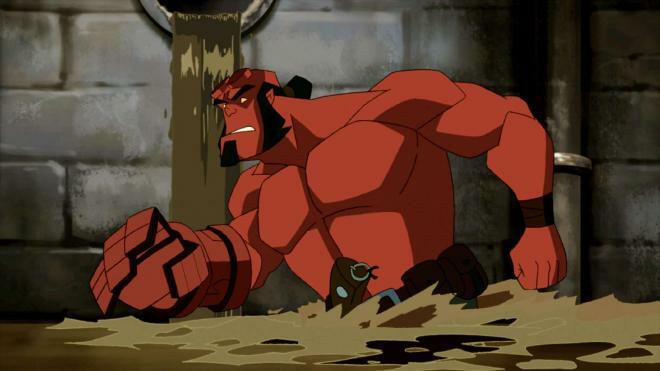 Lionsgate is preparing Hellboy Animated: Sword of Storms and Blood & Iron for 4K Ultra HD Blu-ray on April 2. HELLBOY ANIMATED: SWORD OF STORMS - In the first animated feature from director Tad Stones (Buzz Lightyear of Star Command), a folklore professor becomes unwittingly possessed by the ancient Japanese demons of Thunder and Lightning. But when The Bureau of Paranormal Research & Defense dispatches a team of agents to investigate, a cursed samurai sword sends Hellboy to a supernatural dimension of ghosts, monsters, and feudal mayhem. Now, while pyrokinetic Liz Sherman and fishboy Abe Sapien battle one very pissed-off dragon, a lost and cranky Hellboy must find his way home. Even if he can survive the perilous journey, how much crap does a guy have to put up with from the two most vengeful and ferocious spirits of Japanese legend? HELLBOY ANIMATED: BLOOD & IRON - When Hellboy, Liz Sherman, and Abe Sapien are assigned to investigate the ghost-infested mansion of a publicity-hound billionaire, they uncover a plot to resurrect a beautiful yet monstrous vampire from Professor Bruttenholm’s past. But before they can stop her bloodbath, Hellboy will have to battle harpies, hellhounds, a giant werewolf, and even the ferocious goddess Hecate herself. How much crap does a guy have to take from a Hungarian Blood Countess before he and his surrogate father can avenge the souls of the damned? It’s going to take more than just a horde of very pissed-off demons for our heroes to see the light in this animated adventure from creative producers Guillermo Del Toro and Mike Mignola. You can find the latest specs for Hellboy Animated: Sword of Storms and Blood & Iron - 4K Ultra HD Blu-ray linked from our 4K Blu-ray Release Schedule, where it is indexed under April 2.